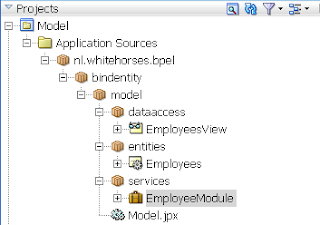 With Soa Suite 11G ( FMW 11G R1) you can now use the Bind Entity activity in a BPEL process, which can do your CRUD operations for you. 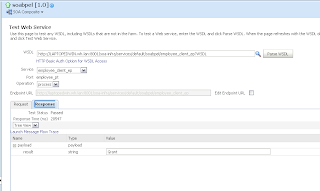 This Bind Entity is connected to a web service reference, this WS has to have SDO types just like an ADF BC SDO service interface. 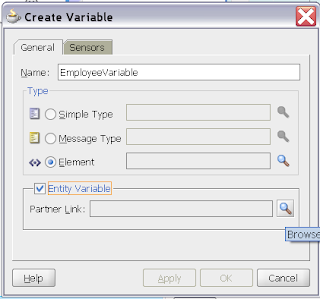 Now you can use an normal Assign activity to retrieve or update data from the Entity variable instead of an invoking a lot of Partner Links. First we need to make a SDO web service. For more details then this short description, see my previous blog or this blog of Andrejus . 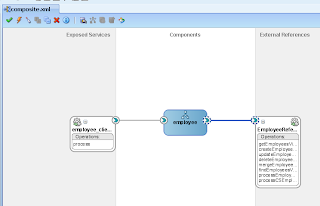 I made an simple ADF BC Model project with an Employee viewobject based on the employees table in the HR sample schema. 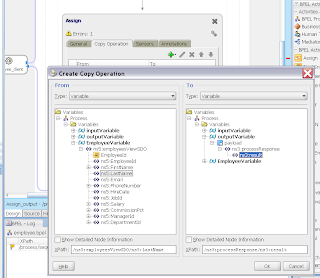 Create a Service Interface on this Employees Viewobject and select all the basic operations. 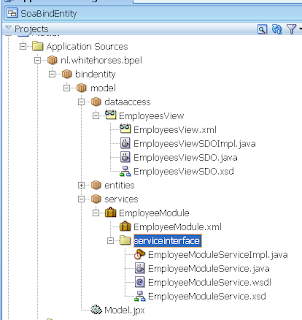 JDeveloper 11G generates SDO types on this employees viewobject and generates a Web Service on this Application Module. 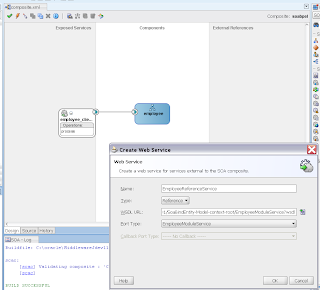 We will use this WS in the BPEL process. 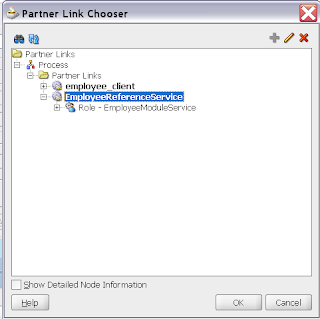 Select the partnerlink in the entity variable. 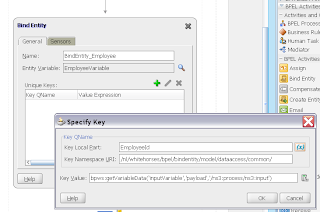 Add the Bind Entity activity to the BPEL process, This will map the Primary Key on the just created variable. 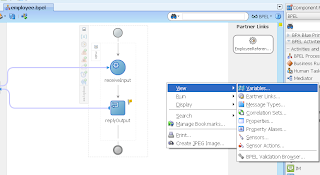 How can a EJB service used in BPEL? 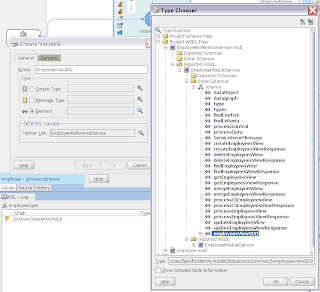 i.e: I have exposed one ejb as service(thru webservice), and this ejb method returns List of specific type data object. 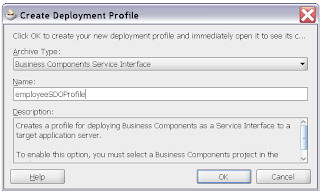 In BPEL I am not able to retrieve this return type, mainly because SOA server complaints cast exception, cannot convert vector to sdo object. 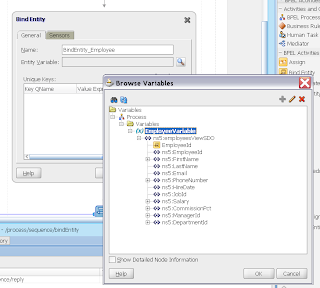 Do you have any example of such ejb service where method returns List or collections and used in BPEL thru variables. 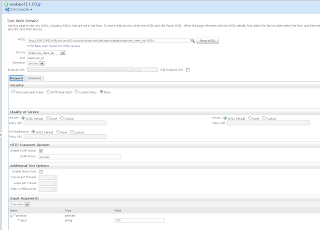 In 11G BPEL is there a way to get a distinct data set after a query comes back from a database adapter? The query we need to pull a full data set that goes into a collection. Then we need to make that dataset distinct by a field. Basically like a Oracle database distinct. Any ideas would be hugely appreciated! I can't choose Bind Entity activity from the components palette. 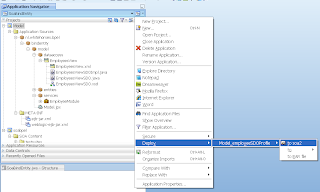 Though I'm on SOA Suite 11g, using jDev 11.1.1.6.0 and my BPEL process actually is of version 2.0. Global var has been defined as well. Any idea what I could verify? 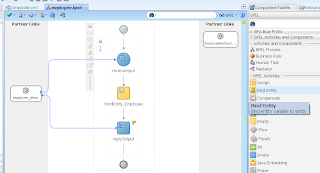 Strang and does it work in bpel 1.1 plus can you create a new variable and choose bind entity. 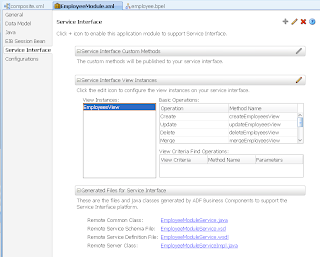 What is best way DB Adapter Or ADF-BC SDO Web services, which one is better and why? ADF BC SDO is a different project/ technology, more development effort and needs to deployed first and is deployed differently than soa. 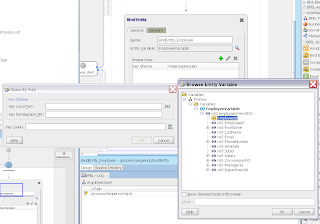 But reuse is great and can be used as bind entity in BPEL.